Mysuru: A two-day Desi Akki Mela (Rice Fair), which began at the premises of the Command Area Development Authority (CADA) in city this morning, drew a good response from public. The Mela will be open to visitors from 10 am to 7 pm today and tomorrow. 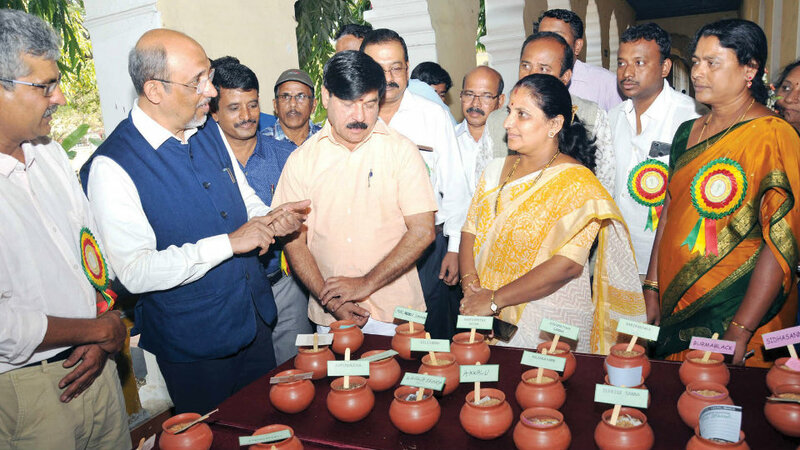 The Mela is jointly organised by Karnataka Agricultural Price Commission (KAPC), Agriculture Department, Mysuru, District Agriculture Training Centre, Naganahalli, Sahaja Samruddha, Batta Ulisi Andolana and Regional Sahakara Savayava Sanghagala Okkuta, Mysuru. 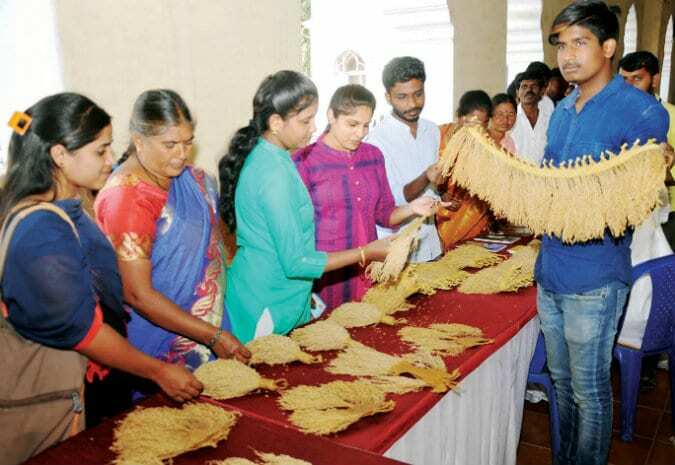 Over 200 native paddy variety growers from across Karnataka, including Mandya, Mysuru and Chamarajanagar districts, have displayed their varieties of desi rice like Karibattha, Karikalave and Navara which have medicinal value. Varieties like Gandhasale, Gamgadale and Jeeriga Samba rice which are the fragrant variety were on sale. They also exhibited Sidda Sanna, which is quite popular in the market due it’s taste, aroma and small grain size, Ratnachoodi and Salem Sanna, which are equally exotic in taste and size. Desi paddy conservers also kept Rajamudi, one of the traditional red rice variety of Old Mysore region and it was one of major attractions of the Mela. This rice, which was patronised by the “royals” (and hence the nomenclature), will join the league of Basmati and get a Geographical Indication (GI) tag in recognition of its unique qualities, according to the Department of Agriculture and Sahaja Samruddha, an NGO working on conservation of traditional and indigenous varieties of agricultural crops. Also available at the Mela are jaggery and variety of desi rice flours. People across the city flocked the venue and bought the desi rice ranging from Rs.80 to Rs.150 per kilogram depending upon their needs. If one is tired of eating the same old anaemic-looking polished rice, then the Mela will be the best place to buy the desi rice. Speaking after inaugurating the exhibition, Mayor Pushpalatha Jagannath stressed the need to encourage and motivate farmers to grow desi paddy varieties which had nutritional and medicinal benefits. Inaugurating the stage programme, former Minister MLA S.A. Ramdas said that India had thousands of varieties of rice and more than 800 desi ragi seeds before the Green Revolution but now only few farmers are cultivating. Earlier, Rajamudi and Sannabattha variety rice were eaten by rich only during festival. He said that Rajamudi was cultivated in large swathes of land in the princely Mysore State ruled by the Wadiyars. However, there is need to promote the paddy conservers and more number of farmers to take up the cultivation of this rice in large scale. The byproducts of this rice are also equally important and beneficial, he added. A workshop on ‘A stable market for Rajamudi and other traditional desi rice varieties through Geographical Indication’ was also held. KAPC Chairman Dr. T.N. Prakash Kammardi, Sahaja Samruddha Director G. Krishna Prasad, VC Farm-Mandya Professor Dr. Rajanna, Asst. Agriculture Director of West Bengal Dr. Anupam Paul, Rajamudi Batta Conservator Hoysala S. Appaji and Padmavathamma, Mysuru, Mandya and Chamarajanagar Districts Farmer Federation President Ramesh P. Rangasamudra and Joint Director of Agriculture Mahantheshappa were present.